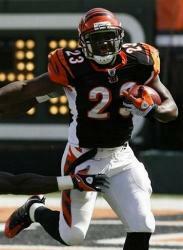 The Cincinnati Bengals entered the 2005 NFL season having not finished with a winning record since 1990. However, following two 8-8 tallies under Head Coach Marvin Lewis, the Bengals were clearly on the rise and entered the October 30 contest against the Green Bay Packers at 5-2. Second-year QB Carson Palmer was coming into his own and had fine wide receivers to throw to in Chad Johnson (later known as Chad Ochocinco) and T.J. Houshmandzadeh. The running back tandem of power-running Rudi Johnson and speedy Chris Perry was productive. A major concern was that the defense tended to give up too many yards against the run. The Packers, coached by Mike Sherman, were still overly dependent on 13th-year QB Brett Favre and, at 1-5, were in a state of decline after making the playoffs in each of the previous four seasons. WR Donald Driver was a dependable target for Favre’s passes, but injuries had depleted the running game and the defense was mediocre. There was a crowd of 65,940 in attendance at Paul Brown Stadium. The Bengals had first possession and drove 60 yards in 11 plays. Carson Palmer finished it off with a four-yard touchdown pass to Chris Perry for the early lead. The teams traded punts to conclude the opening period, but the Packers put together a 66-yard scoring drive in 11 plays to start the second quarter. Favre completed all five of his passes, including one to TE Bubba Franks for 21 yards to the Cincinnati seven in a third-and-six situation. RB Tony Fisher scored a TD from a yard out and, with Ryan Longwell’s successful conversion the contest was tied at 7-7. Cincinnati responded with another long drive. Helped along by two defensive penalties, Palmer passed to T.J. Houshmandzadeh for an eight-yard touchdown. 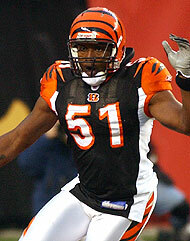 The Bengals had a chance to score again in the first half as Favre’s tipped pass was intercepted by LB Odell Thurman (pictured above). Starting at their 43, the Bengals advanced to the Green Bay 29 but time ran out and the score remained 14-7 in favor of the home team at halftime. The clubs again traded punts to start the third quarter but a promising Green Bay drive into Cincinnati territory that included a 28-yard gain on a pass to Donald Driver ended with Favre being intercepted for a second time. CB Deltha O’Neal grabbed the throw at his own two yard line, which stopped a potential Green Bay score but also pinned the Bengals back deep in their own territory. After getting out to their 40, they had to punt. Once again O’Neal picked off a Favre pass, this time returning it to the Green Bay 42 for more favorable field position. The Bengals gained nothing in three plays, however, and again kicked it away. This time it was CB Tory James intercepting Favre on the first play of Green Bay’s ensuing possession. Cincinnati still couldn’t move the ball as the game headed into the fourth quarter, but again the Bengals kicked and got the ball back on an interception. It was the second pickoff for Thurman, and finally Cincinnati capitalized on the very next play when Palmer passed to FB Jeremi Johnson for a 27-yard touchdown. The Packers followed up with a series that didn’t end with an interception, but they had to punt after losing ground. Cincinnati’s next series ended with Palmer being intercepted by CB Ahmad Carroll to give Green Bay another shot with 8:28 remaining. The Packers made the most of the opportunity, going 88 yards in 13 plays and converting three third downs along the way. A one-yard Favre completion to Franks for a touchdown followed by Longwell’s successful extra point made it a seven-point game with just over three minutes on the clock. The Bengals played conservatively on their next series as the Packers used up their timeouts. Kyle Larson’s 47-yard punt was downed at the Green Bay 10 and there were now only 56 seconds remaining on the clock. A 48-yard pass interference penalty moved the ball into Cincinnati territory and Favre threw to WR Antonio Chatman for 19 yards to the 28 yard line. With the defense reeling a bizarre circumstance ensued as a fan ran onto the field, causing the next play to be blown dead by the officials. Grabbing the ball out of Favre’s hand, the inebriated man eluded security and caused play to be halted for several minutes until he was removed. Once the action resumed, Favre was sacked for a two-yard loss by the re-grouped defense and then threw a pass from beyond the line of scrimmage that resulted in a game-ending penalty. The Bengals had held on for the 21-14 win. The Packers outgained Cincinnati (353 yards to 317) and had the edge in first downs (23 to 21). However, they suffered the five turnovers on interceptions as opposed to one by the Bengals. Carson Palmer completed 22 of 34 passes for 237 yards with three touchdowns against one interception. Rudi Johnson ran for 72 yards on 22 carries and Chris Perry (pictured at left) added three attempts for 18 yards in addition to a team-high 6 pass receptions that gained 25 yards and included a TD. T.J. Houshmandzadeh gained 77 yards on 5 catches and Chad Johnson, who also caught 5 passes, added 62 yards. For the Packers, Brett Favre was successful on 26 of 39 throws for 279 yards and a TD, although he was picked off five times. Antonio Chatman caught 8 passes for 97 yards while Bubba Franks contributed 62 yards and a touchdown on 7 receptions and Donald Driver had 5 catches for 76 yards. Tony Fisher led the running attack with 51 yards and a TD on 17 carries. It was the single event that rendered the game notorious, and while it disrupted a Green Bay possession that could potentially have tied the score, the five interceptions had the greater cumulative impact on the outcome. Cincinnati ended up with an 11-5 record and topped the AFC North. However, they lost in the Wild Card round of the playoffs when Carson Palmer went down with a major knee injury early in the contest. The Packers continued to flounder and, at 4-12, ended up at the bottom of the NFC North with their first losing season since 1991 – the year before Brett Favre’s arrival.